Make your planting displays as beautiful as your flowers by placing them in these Gardman Copper Victorian Parasol Hanging Baskets. These two, distinctive hanging baskets add an ornate look to your porch or yard, while offering a deep planting area for your favorite flowers. A band of scallop shell and leaf shapes, crafted from hardy steel, creates the top, 14" diameter rim, and additional steel wire arches and bands complete the generous pieces. A copper colored finish throughout the steel wires and on the bottom orb further the elegant look, and an included, coco fiber liner in each helps keep your soil tidy. These liners also retain moisture, preventing your plant roots from drying, and the included chain and "S" hook allow you to hang each item. This set is sure to bring timeless charm to your wall or patio, and the units will remain beautiful and copper toned for many seasons. 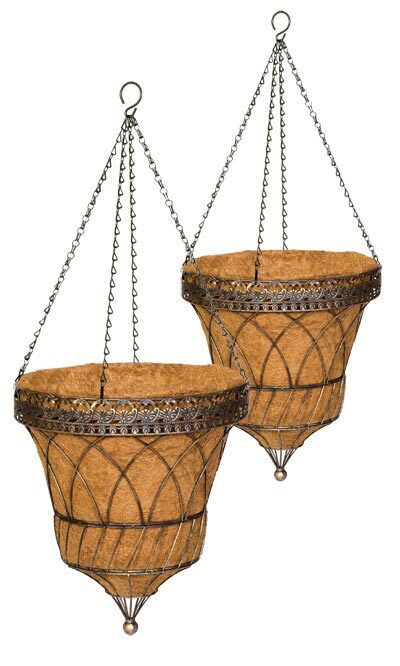 Flank your doorway or walkway with striking plants in these Copper Victorian Parasol Hanging Baskets. Note: This case pack includes 2 of the Gardman Victorian Parasol Hanging Baskets with Chain, Copper, 14" dia.